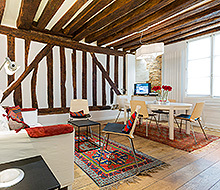 This two bedroom, two bathroom apartment is on the first floor (American second floor) of a beautiful 18th century building. Recently renovated and with double-paned windows for quiet, this 882 sqft. apartment is accessed through a pleasant courtyard; the front windows look out onto the courtyard and the back windows have a view of a pretty garden behind the building. The large main salon has an open floor plan to include the living and dining areas. The salon has three large windows, a decorative marble fireplace, and parquet floors. The room features a comfortable couch, bookshelves, and antique bureau, along with well-chosen artwork. The dining area has a window view, good lighting, and seating for up to six in cushioned chairs that sit around a large wood table. The kitchen, with its lovely garden view, is very well outfitted, as the owners are enthusiastic cooks; some of its highlights include smooth slate countertops and backsplash and a Nespresso maker. The master bedroom includes a comfortable Meridiani king-size bed with padded headboard, wall-mounted nightlights, double closet, amble storage, and a view of the garden. The room is complete with a desk and an Etro-upholstered antique bench. The master bedroom also has an en suite bathroom with a bathtub, shower, towel warmer, washbasin, WC, and window. The second bedroom has a king-size bed that can also be split into two single beds. With padded headboard, window, and nightstands, this bedroom also has plenty of storage space and storage boxes on wheels under the bed for extra space. Across the hall is a second small shower bathroom, also with a WC and window. Although compact, the shower with its large rain showerhead and window is comfortable and pleasant to use. 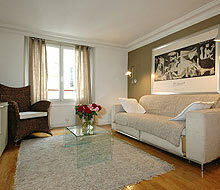 The location of 24 Rue Dauphine was wonderful...right in the heart of the Left Bank. The apartment had a few issues...we were only given one key as the prior tenants forgot to return the 2nd key...it was difficult getting a 2nd key and we had to coordinate our schedules to be at the apt at the same time. This should not have happened...have extra keys made. The sofa in the livingroom was hard as a rock! The washer/dryer worked very sporadically. The apt needs some attention and for the price, I think it was too high considering the issues. The master bedroom in this apartment is extraordinarily quiet. It is located on the back of the building away from the courtyard as well as the street. We never heard a sound in the bedroom except the occasional creaking of the parquet floor in the apartment above. This, alone, makes this a highly desirable rental. 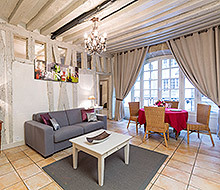 As well, each person at Paris for Rent is exceptionally gracious and helpful and provides an IMMEDIATE response to any question or issue.